Dialing in the best stand up paddleboarding stroke is key to improving your speed and confidence on the board. It’s also a constantly evolving process based on the conditions and your fitness level and it’s something you can expect to improve over time. As you get a feel for the water and the motion of the stroke your stroke will naturally become more efficient and powerful, but if you pay attention to a few key points, you can accelerate your learning and learn to go faster and stay straight on the water. When you’re learning any dynamic sports movement like how to swing a baseball bat, tennis racquet, or golf club there may seem to be too many things to keep in mind. However, when it comes to the best paddleboard stroke, the most important is not to overthink things. There are a few elements to having a more efficient paddle stroke, but don’t worry. It’s not super technical and should always be fun! That’s why the sport is exploding in popularity.😉 Stay loose and let the water and your body find a rhythm that feels natural and comfortable. Your fitness level will play a role in determining what stroke is best for you. If you notice you’re feeling discomfort rather than just the unfamiliar experience of moving in a new way, you’re probably reaching too far, or pulling with just one muscle group rather than using your whole body. Keep your knees bent and adjust by taking shorter, more frequent strokes that engage your hips and torso as well as your arms, shoulders, and back until you feel more comfortable. Even if you’re not the quickest on the water your first time out, you’ll be surprised at how soon you’ll be able to reach further and pull harder each time you go paddling. 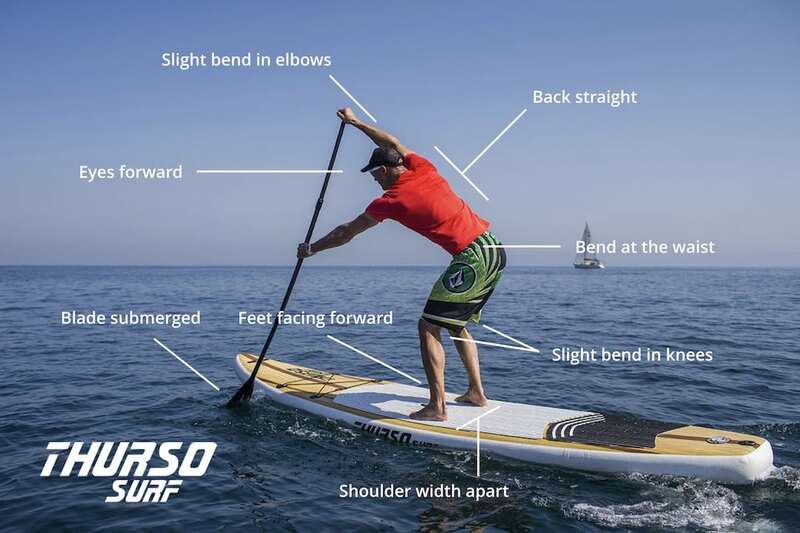 Now let’s dig into the details of the perfect paddleboarding stroke. Infographic: the elements of a perfect stroke point-by-point. First, let’s focus on your footwork. Then we’ll build you the best paddleboard stroke from the bottom up. Your feet are your foundation and the base of your power. 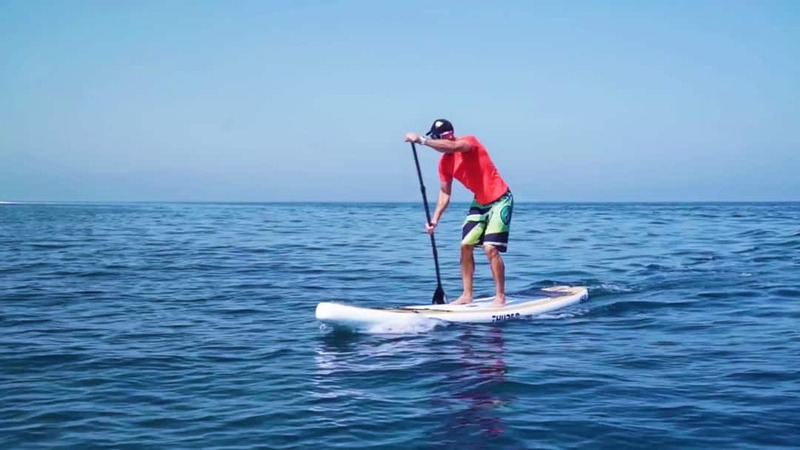 On calm water, start with your feet facing forward about shoulder width apart. This is called the ‘neutral stance.’ From here, it’s equally easy to paddle on either side and doesn’t require you to shift your weight and feet every time you switch sides with your paddle. 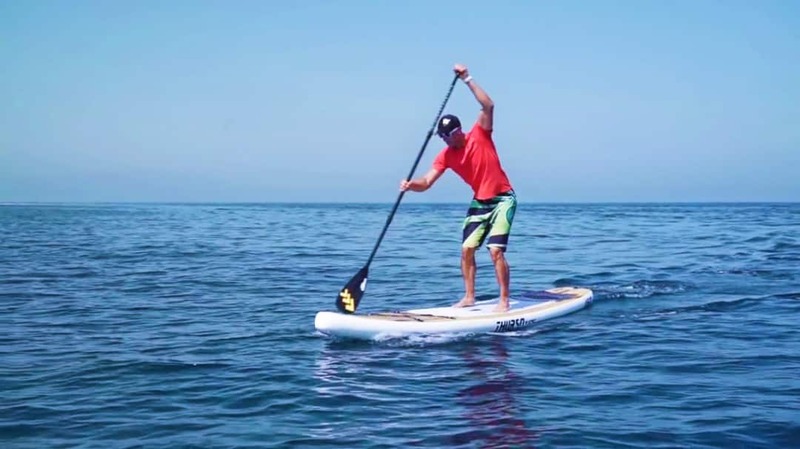 In the neutral stance it’s easy to paddle straight ahead and keep the nose pointed where you want to go. Make sure your knees are bent and at the ready, almost as if you’re preparing to jump into the air or squat down to pick something up. Keeping your knees bent will help you maintain your balance. When you lock your knees it’s easy for a slight wobble to transfer from your feet to your knees to your hips and cause you to fall. Keep your hips loose like a hinge so you can bend at the waist to reach forward easily. Think of your whole body as a coiled spring. Your stance is designed to act like a shock absorber. If each link in the chain, your feet, knees, hips, and lower back, are loose and at the ready, you’ll smooth out the motion of the water before it tilts your center of gravity. Now that you’re foundation is set, it’s time to get on the move. To ensure you have the correct grip, grab the paddle with one hand on top and hold it over your head. Slide the other hand along the shaft of the paddle until your elbow are at right angles. This will give you control over your paddle and set you up for a powerful stroke. Make sure that you’re holding the paddle with the blade angled forward. Paddles are designed so that when your paddle is in the water by your feet, the blade is pointing directly down. Thurso Surf paddles are designed with graphics on the front so you can easily tell that you’re holding it correctly. 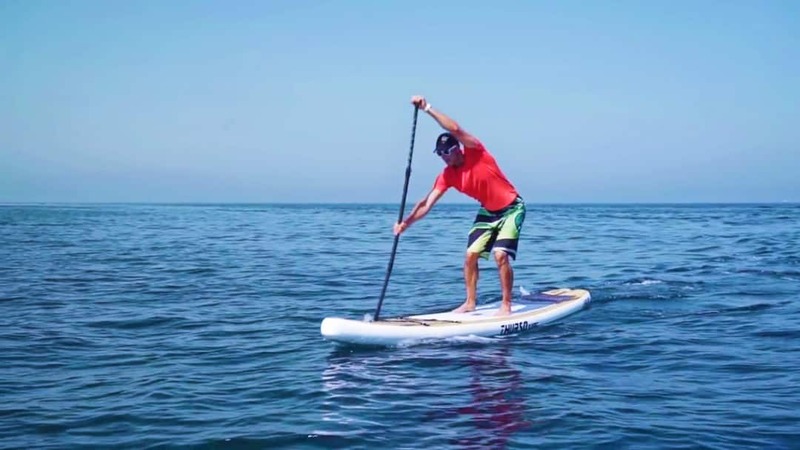 It’s ok to look at your feet as you get set in your stance the first few times or to watch your stroke as you glide past your paddle on occasion. This can be a good way to analyze what you’re doing right and what can be improved. However when paddling, it’s important to keep your eyes forward rather than looking down or concentrating on yourself. If you’re eyes are focused somewhere between the horizon and the nose of your board, that’s where you’re likely to go. Looking down and to the side at your paddle, feet or wake, will destabilize you and you won’t be able to read the water ahead. A good forward reach extends the paddle ahead of you so it can catch the water. If you want to dial in the best paddleboard stroke there are a few points to think about. You want to bring the paddle straight forward along the rail, or side edge, of your board. Swinging it out widely is a less efficient movement. Aim for the paddle to enter the water a comfortable distance ahead of you toward the nose. To do this, activate your core. Make sure your lower arm is extended and, to minimize stress on your shoulder, the elbow of your upper arm should stay in line with your body, near your head. Bend forward at the hips with your back straight and allow your shoulders to twist slightly as you set the blade of the paddle into the water. The paddle is held with the graphics facing forward as the paddler leans forward, arms extended to set the blade into the water during the reach phase. The catch is the point where your paddle meets, or catches, the water. Now that you’ve reached as far forward as you comfortably can, let the paddle enter the water with the blade perpendicular to your board. Don’t poke or jab the water with the paddle. Think of the paddle as an extension of your arms and let the bend of your hips and twisting of your shoulders carry the blade forward into the water in one smooth motion. When it strikes the surface, the paddle should enter the water as smoothly as possible, like an olympic diver, with very little splash. A smooth entry from your perpendicular blade will set you up to pull through the power phase of your stroke with maximum displacement and forward thrust. In the catch phase, notice that the paddler is fully extended at the limit of his comfortable reach when the paddle breaks the water, almost without a splash. In the power phase you’ll pull your body forward past the point where your blade entered the water. This is the part of the SUP stroke that generates thrust so the better your technique, the further you’ll go. 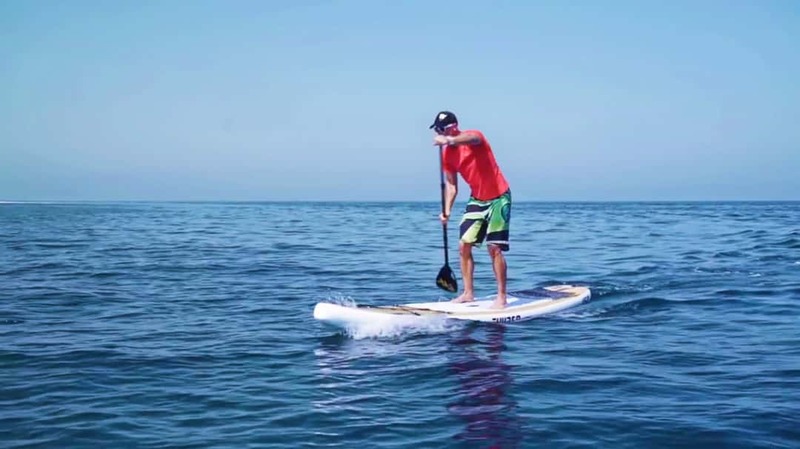 Focus on getting the blade of the paddle fully submerged and keeping the angle perpendicular with your board through the stroke. If you find you’re struggling to get the blade under water, take advantage of your adjustable paddle to make it a bit longer. This will mean you’ll have to bend forward less, but it’ll require you to take more frequent strokes. Play with paddle length and stroke frequency until you find your comfort zone. Once the blade catches the water and is fully submerged, let your lower shoulder dip as far as needed and allow your torso to twist. With the blade set in the water, keeping your lower arm straight but not locked, engage your core to pull yourself upright. Draw yourself past the point where the paddle first entered. Think of your paddle as a post that’s firmly planted and keeping your lower arm outstretched, focus on pulling your body forward and upright using your hips and core rather than digging into the water with your arms, shoulders and back. The muscles of your core and posterior chain are far larger and stronger than those of your arms and shoulders. So, if you noice your arms tiring quickly, try to engage your core and hips more during your stroke. Maintain a firm grip on the paddle so that it doesn’t flutter as you pull. Fluttering means losing power. Keep the pulling motion of your stroke as steady as you can as you draw the paddle alongside the length of your board. The paddle blade is fully submerged and drawn alongside the rail of the board as the body begins to stand upright in the power phase. As the paddle comes alongside your legs, it’s time to slide the blade out of the water. Your paddle loses leverage as it goes past the line of your body. With too long of a stroke, you’ll twist your upper body too much which decreases efficiency and because more of your weight is shifted to one side, makes you less stable on the board. If you find yourself splashing by lifting water at the end of your stroke, or shoveling, focus on exiting the paddle blade earlier alongside your feet. 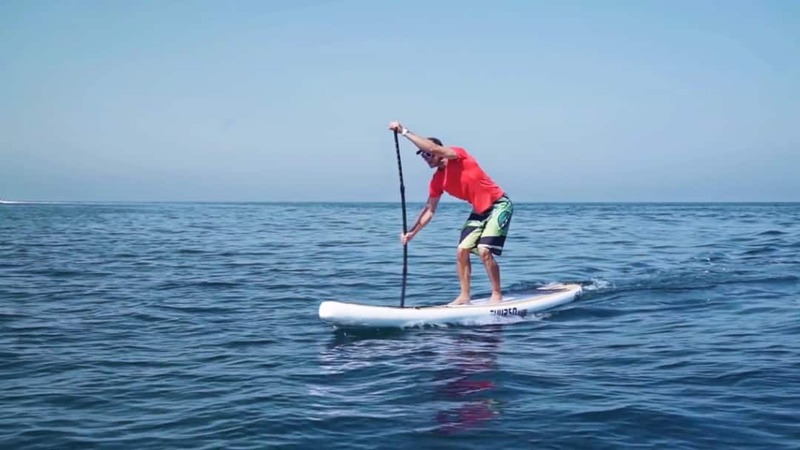 Rather than pulling up with your arms at the end of the stroke to free the paddle from the water, just return your body to an upright standing position. As you stand up and your shoulders square, your upper hand will fall down and inward toward your waist and the blade will glide free of the water with minimal resistance. 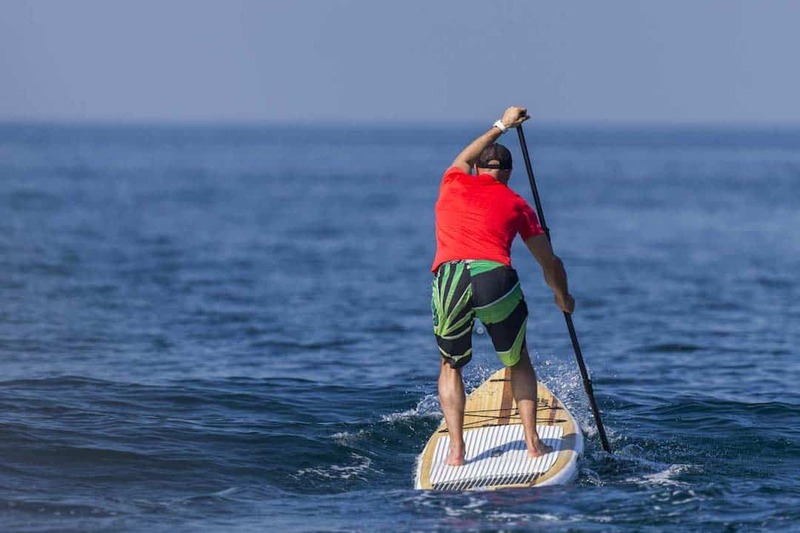 In the release phase, the paddle exits the water with the motion of the torso coming upright. Note the arms remain mostly straight. Once the blade comes free of the water during your release, you’ve entered the recovery phase of your stroke. Finish coming upright, and let the tension in your muscles, especially those of your neck, shoulders and back, release. This is a chance to give your muscles some brief rest before leaning into your next reach. To maximize efficiency, swing the paddle forward close to the board along the rail rather than arcing out from your body. During the recovery phase the shoulders rotate back to square as the paddler resumes an upright posture. Now that you’ve got a good idea of what the perfect SUP stroke should look like, it’s time to put that knowledge into practice and get out there. Learning to paddle is always a great amount of fun with a harmless and refreshing splash down in the water to remind you to hone your technique. The most rewarding part is progressing from the usual shaking beginnings to noticeable improvement and confidence to the ongoing challenge of optimizing your stroke technique for all conditions. We can’t wait to see you out there. Hit us up in the comments or on social anytime with questions about the gear or how to improve your paddling technique.